The Chicago Council on Global Affairs has released another in its continuing series of public opinion polls measuring the views of Americans on issues related to Korea and the U.S.-Korea alliance. The headline from the report published by the council zeroes in on the finding that, "..in a hypothetical North-led invasion of South Korea, 47 percent of the American public support the use of U.S. troops to defend South Korea (49% opposed). This marks an all time high. When the question was first asked in 1974, fewer than two in ten stated support." In other findings, 55% of Americans viewed North Korea's nuclear weapons program as a critical threat. This, along with mainstream press coverage of North Korea's young leader and his sometimes bizarre behavior are the most likely cause of increased public support for defending South Korea, if it is attacked. Remember, in historical perspective, that the Korean war itself was unpopular with the war-weary American public after WWII and that reality helped sweep Dwight Eisenhower to a landslide victory in the 1952 presidential election. One of the poll findings that I found most interesting was the shift in public views in the U.S. about what should happen after North and South Korea reunify. 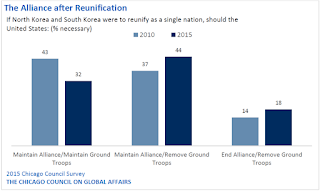 As shown in the accompanying graphic, the number who think that the U.S. should maintain its alliance but remove ground troops increased substantially from the 2010 poll results. I have long held the view that most all of the U.S. forces in Korea should be withdrawn upon unification, and perhaps even used as an incentive to encourage peaceful unification. The only reason for maintaining such a large presence here would be if the reunified Korea requested it and if the regional security situation demanded it. However, peaceful unification itself would remove the main reason for such a large U.S. military presence here. A firm foundation for the future alliance between Korea and the U.S. is much more likely to be based on such factors as trade, technology, and commerce along with continued significant educational exchange and collaboration.